My flight to Columbus for the 2015 American Association of School Librarians conference was scheduled for 10 a.m. on 11/6/15. My panel was scheduled for 4:30 p.m.
At 3:30 a.m. that day, I received an email saying my flight was canceled. However, I didn’t see that email at 3:30 a.m. I also didn’t see it at 6:45 a.m., the time for which I’d set my alarm. I saw it about an hour earlier, when I happened to temporarily wake and for some reason violated my own policy of not checking my phone in the middle of the night. When I learned of the cancellation, I immediately got up to scramble to book another flight. I had two choices: a flight double the price or a flight that would get me in after the panel. Neither, obviously, worked. So with regret, I told the organizer of my panel, librarian Matthew Winner, that I wouldn’t make it. I didn’t feel like this would disapppoint him or the other panelists (Matthew Cordell, Loren Long, Jonathan Auxier, Sudpita Bardhan-Quallen, and Rafael Rosada)—after all, there were five of them, each able to draw a crowd on his/her own, as could Matthew. But I was bummed. 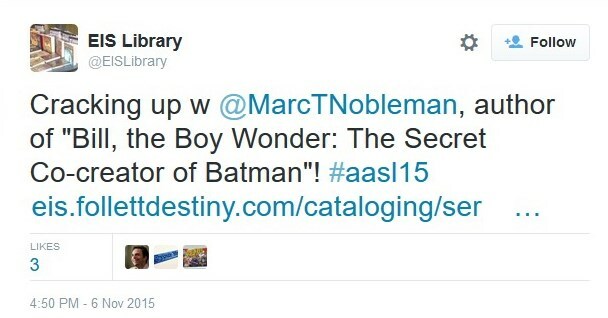 I’d really been looking forward to this, my first AASL. “Drive to Ohio?” I said, in Maryland. One of my lacking areas is geography. I would’ve said it’d take 10 hours to drive from Bethesda to Columbus. Turns out it takes six—not a quick drive, but infinitely better than 10. And if I left within the hour, I should arrive in plenty in time. So I hopped in a car and did just that. It was a warm, overcast day; the drive was a bit monotonous but did offer a few sweeping views of unspoiled valleys. Adrenaline got me there as much as gas, and it was so worth it. AASL scheduled our panel for a fairly large room, and I’m happy to report that it seemed pretty full. Other kidlit friends in attendance included Don Tate, Susannah Richards, Steve Light, and Margi Preus. When asked what our favorite social media site was, I confessed that I spend 6-8 hours a day on MySpace, and by the audience’s laughter, they thought I was kidding. In his charming southern accent, Matthew Cordell wondered aloud if he should be using what he called (or what sounded like) “TweetDick,” and a number of others jumped in to clarify that he would probably find TweetDeck more useful. Master of Ceremonies Matt was quick with one-liner replies to certain comments. Everyone, frankly, was a joy. All had something of substance to say. All in all, it went by too fast. But then the group (plus some librarian friends) decamped to a nearby restaurant to keep the conversation going, sans microphones. The following morning, I did my 30-minute signing and my 360-minute drive home, tired but still content that I’d gone with Plan C (car to Columbus). After the “Marc” photo was nixed, I crashed the “Matt” photo. Oh, and while talking with Matt Cordell and Loren Long, I made a prediction that I put into writing. This is one conference I want to ask to the dance again. Full disclosure: All but the grainy restaurant photos came from social media. Love this, Marc! So glad you came -- hooray! 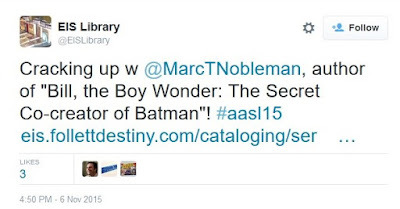 Hope to see you at more AASL conferences to come.